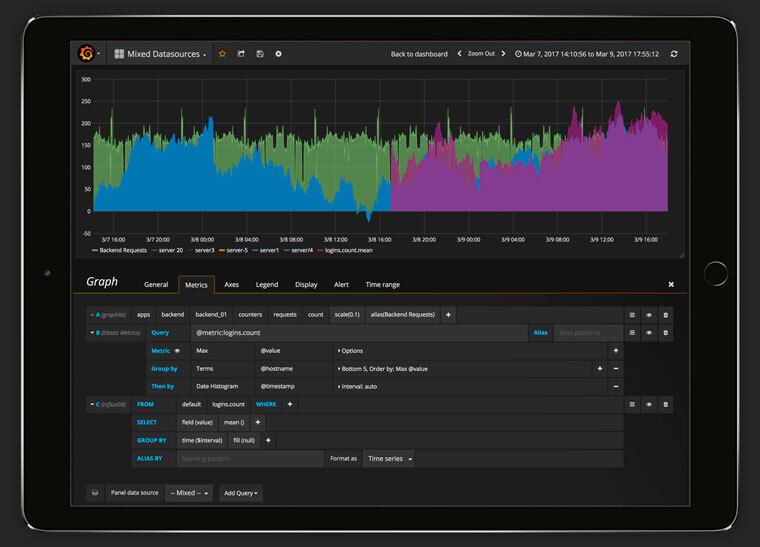 Grafana is the leading open source software platform for time series analytics and monitoring. Various data sources, such as AWS CloudWatch and Prometheus, integrate with Grafana to produce Grafana dashboards. These dashboards are useful because they bring together data and help users to gather insights through real-time analytics. No matter where your data is, or what kind of database it lives in, you can bring it together with Grafana. Beautifully. InfluxData and Grafana have a strong and active partnership that dates back to April 2014 when Torkel Ödegaard added InfluxDB support in Grafana. At Grafanacon 2016, InfluxData Founder Paul Dix spoke about why and how InfluxData uses Grafana, noting: “We use Grafana and know most of our users use it. Grafana is great for visibility.” Paul showed a live Grafana network monitoring dashboard presenting stats from a live InfluxDB cluster that showed data on Disk Utilization, HH Queue Depth CPU Utilization, Memory Usage, Write Point Requests, Active Queries, Write Errors, System Loads, and many other metrics. In that presentation, Paul showed another dashboard that displayed the health of an instance, by showing stats like Established Connections, Write points/second, and WAL Cache, collected by Telegraf and stored in InfluxDB. He also discussed how the series cardinality is tracked through a Grafana dashboard to identify if a problem occurs with a customer trying to run too many series on a small machine. The InfluxData-Grafana partnership has grown to extend to mutual sponsorship. Grafana sponsored and presented in the first edition of InfluxData’s InfluxDays conference on November 14, 2017 in San Francisco, CA. And InfluxData sponsored Grafana Labs’ Grafanacon in Amsterdam in 2018. In the 2018 edition of InfluxDays San Francisco, Grafana will be a Gold Sponsor and will be presenting as well. Click here to learn how to generate Grafana dashboards from a datasource like InfluxDB. To paint a fuller picture of how InfluxDB pairs with Grafana, see how some of our customers have used InfluxData and Grafana for DevOps, IoT, and Real-Time Analytics use cases. Below are some case study overviews and links on specific use cases of this twin solution. Houghton Mifflin Harcourt, a Boston-based educational and trade publisher, uses InfluxData for standard DevOps monitoring, gathering and tracking KPIs to measure its online educational business, and gaining real-time visibility into its AWS spend that covers several accounts across multiple business units and a large group of distributed developers. Houghton Mifflin Harcourt stores annotation of events, CRO calls from Jenkins, for deployment, pushing those points into InfluxDB .Then those are used for annotations with Grafana. Flux is a new language that InfluxData is building for InfluxDB 2.0. Listen to Matt Toback from Grafana Labs, in his talk at InfluxDays San Francisco 2018, share the latest updates they have made with their Flux builder in Grafana.